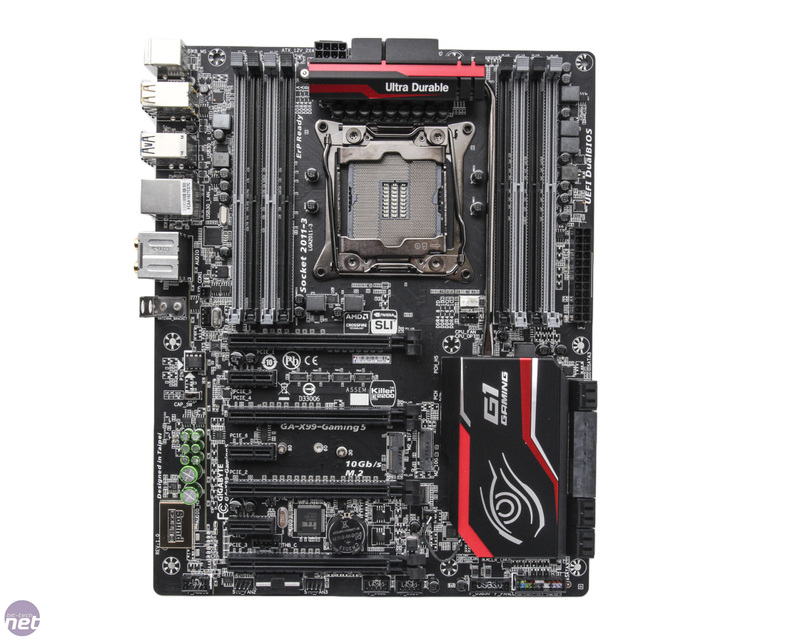 Another good-looking motherboard is the GA-X99-Gaming 5. 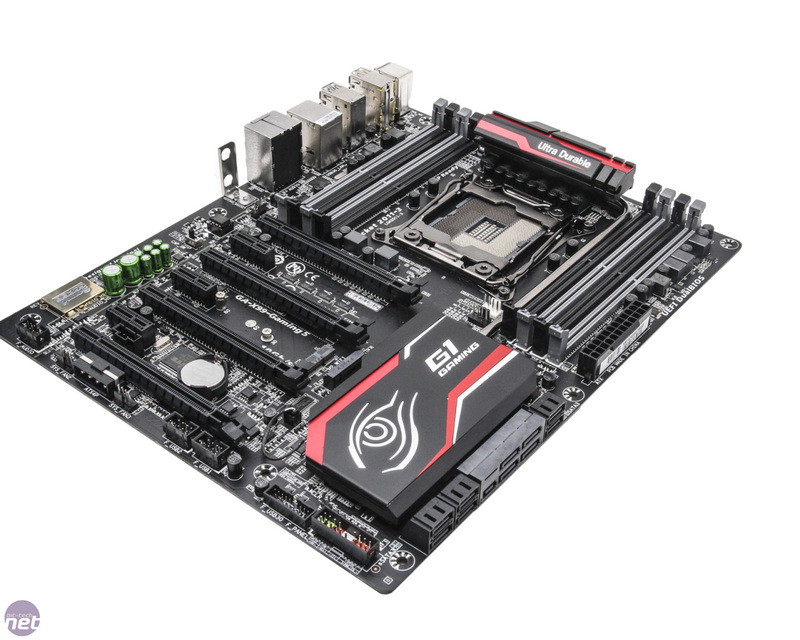 Gigabyte has told us it's keen to claw back some of Asus's market share and judging by its offerings so far it's certainly on the right path. 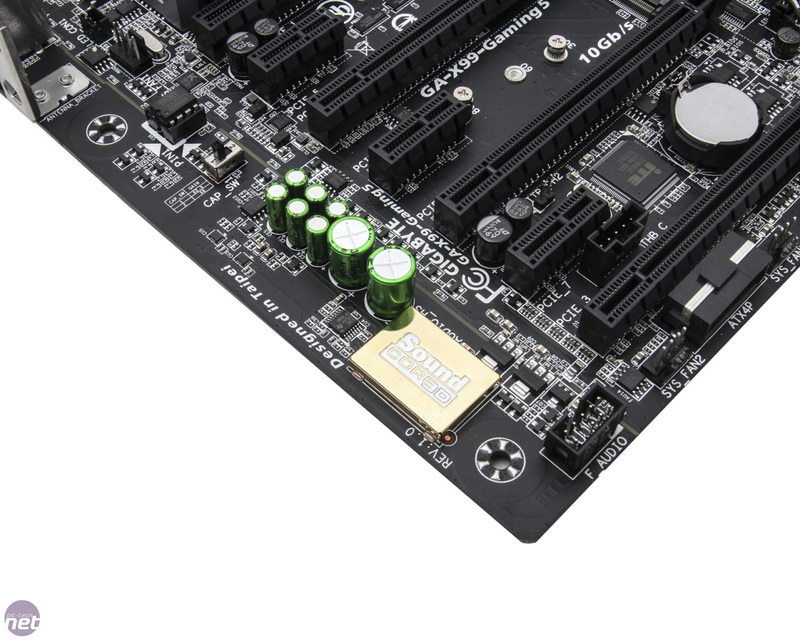 The GA-X99-Gaming 5 sits in the mid-range of its current lineup, with several boards above and below in terms of price. However, unlike the similarly priced EVGA X99 Micro, the GA-X99-Gaming 5 has plenty of features to warrant the £200 it will hit your wallet for. 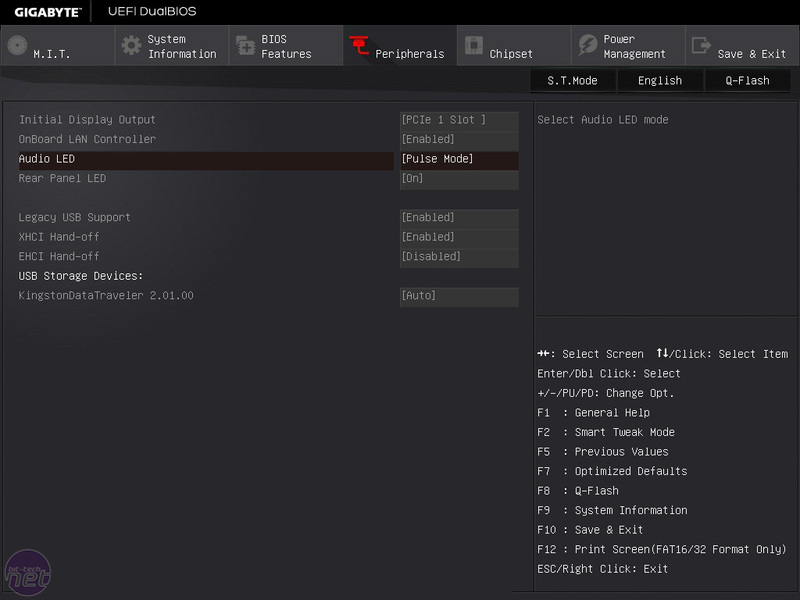 There's lighting control, which allows you to tweak the chipset and audio lighting modules to pulse or beat in time with music and SATA Express and M.2 are supported with two M.2 ports as well. 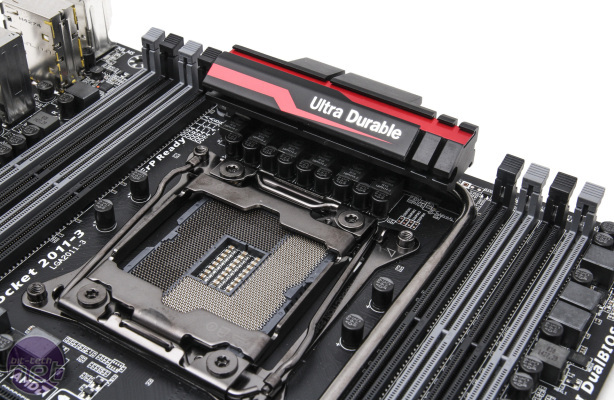 Unlike Asus, which opted for a vertically-mounted on-board port plus a PCI-E add-on card, Gigabyte has simply stacked the ports, which sit beneath the second 16x PCI-E slot. 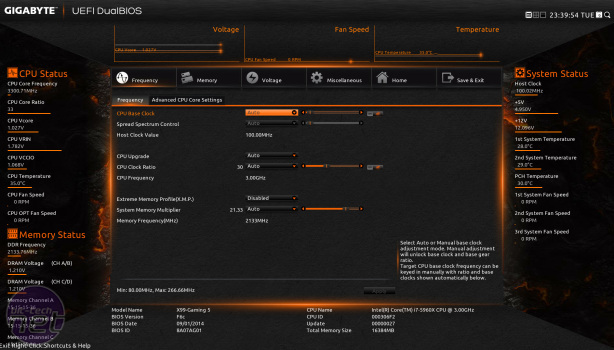 The lower slot is limited to Type 2230 devices but the upper slot can cater for Type 2280 and Type 2260 SSDs. 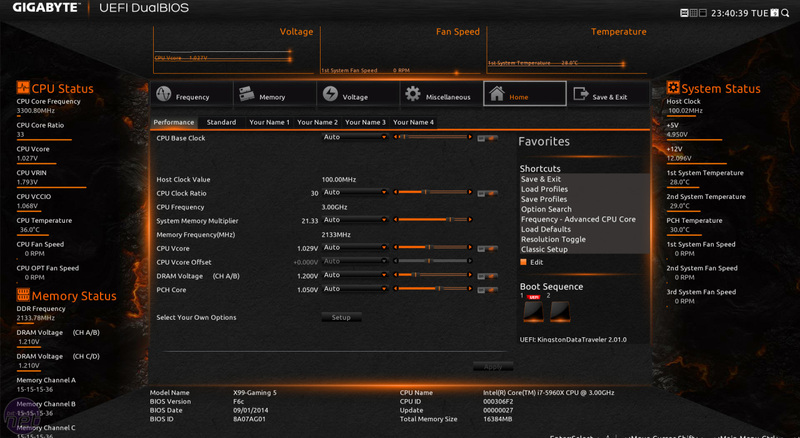 Gigabyte has also seen fit to double-space the two and three-way multi-GPU slots, with slots one and three catering for dual x16 setups giving the top card loads of space for dual-slot coolers. 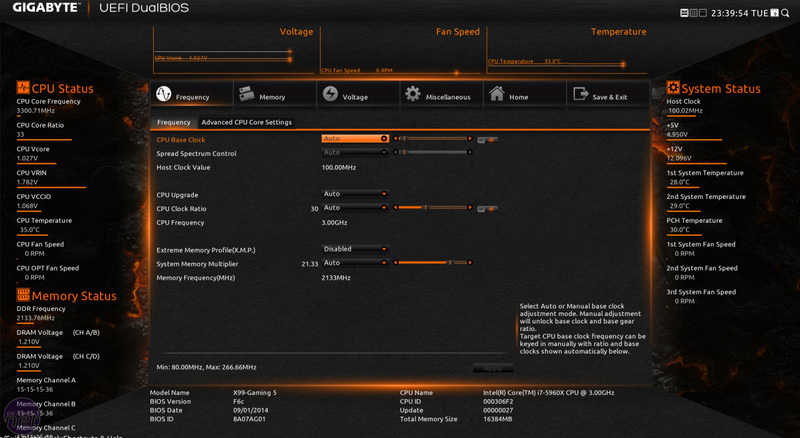 The down side here is that multi-GPU ribbons will span all three of the 1x PCI-E slots. 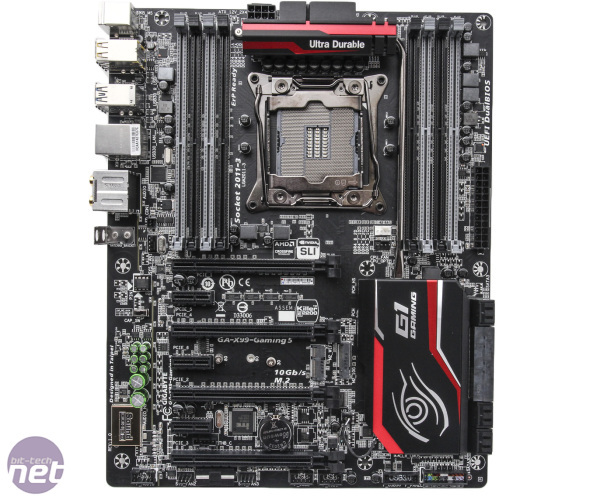 For the most part then, like the Asus X99 Deluxe, the GA-X99-Gaming 5 makes for a great base for a two-card setup air-cooling wise, although dropping a third card in will see the lower two GPUs squished together. Layout is otherwise pretty good, with all of the SATA ports mounted at right angles to the PCB and the main connectors located at the edges of it. 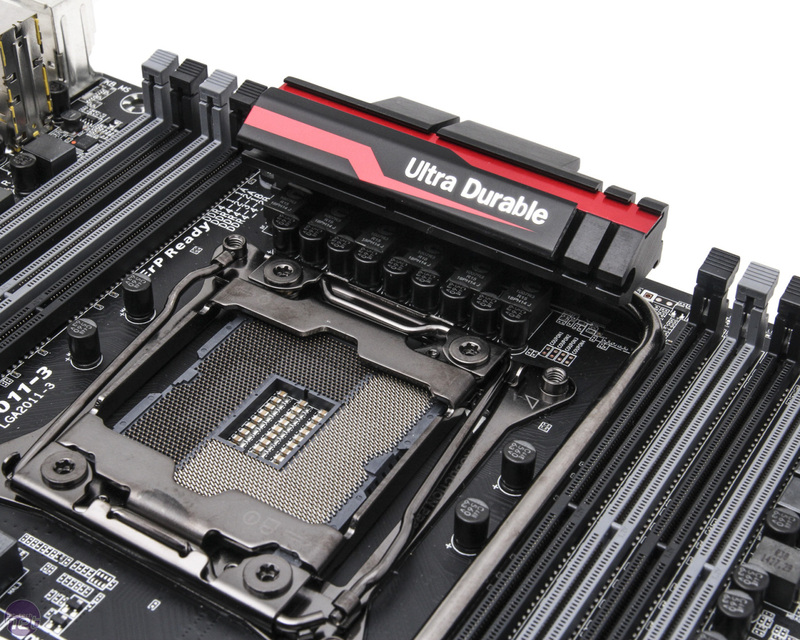 The two CPU fan headers are located south of the CPU socket itself, but unless you were planning to tuck the cables behind the PCB or use them for the radiator fans on an all-in-one liquid cooler, this shouldn't impact too much on cable tidying. 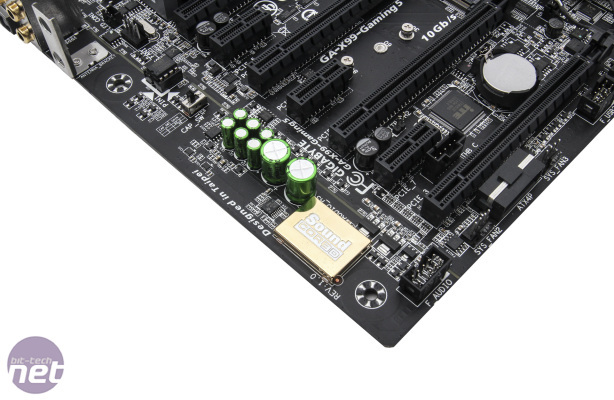 Perhaps the centrepiece of the GA-X99-Gaming 5 is its Creative Sound Core 3D chip. 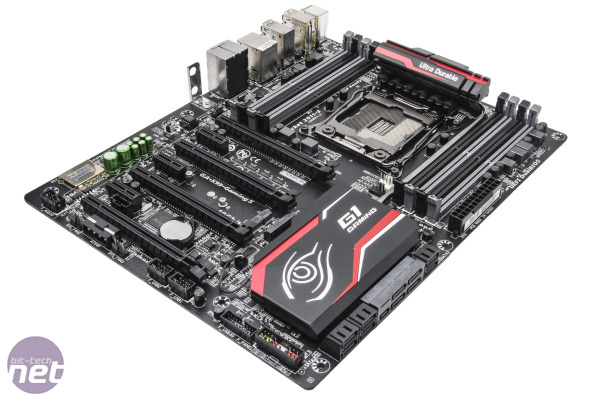 This is combined with a TI Burr Brown OPA2134 operational amplifier and SBX Pro Studio Audio Suite along with USB DAC supported enhancements and gold-plated connectors and Gigabyte has seen fit to include a Killer E2201 Ethernet controller too. 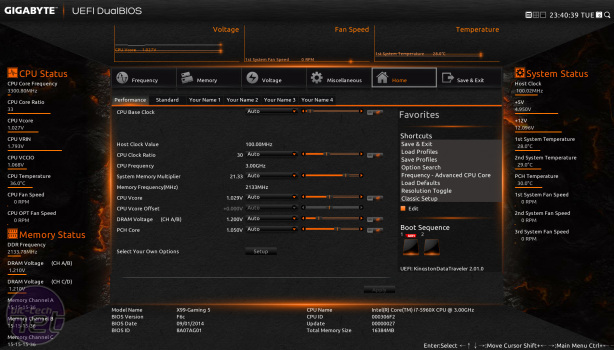 The GA-X99-Gaming 5 was another motherboard to suffer from a toasty-running CPU, which was stable at 4.25GHz but quickly throttled under full load in Prime95. 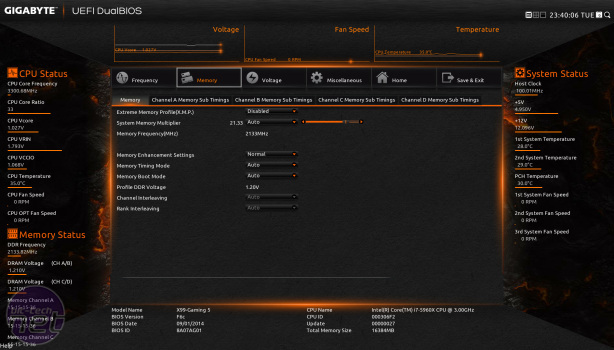 As such we had to tune things down a bit, settling on 4.2GHz using a vcore of 1.245V. 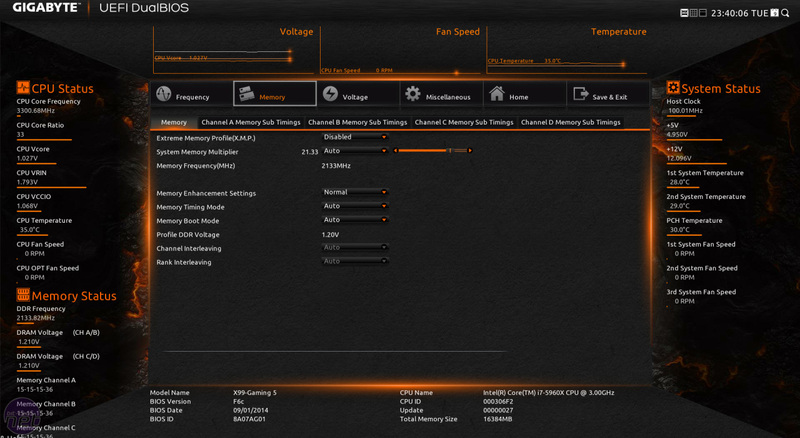 Unlike the Asus X99 Deluxe, the GA-X99-Gaming 5 was happy to run the memory at 2,666MHz without touching any other settings although the EFI was decidedly basic, especially when it came to dealing with CPU straps. In the end, we left the baseclock at 100MHz and simply boosted the multiplier up another notch to get to 4.2GHz. 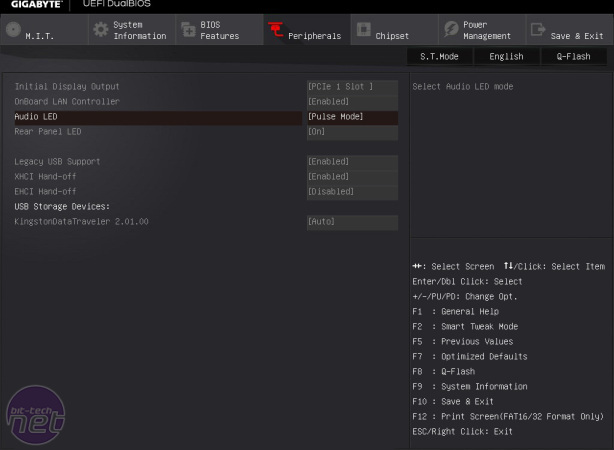 The EFI in general is pretty basic too, and there was no easy way to see realtime changes in CPU frequency following your tweaking which could make regular overclocking a bit of a frustrating process.